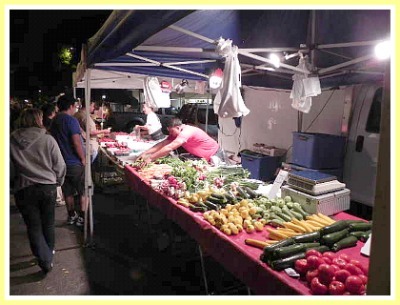 Fantastic, Fresh Veggies, Fruit and just about any thing else you could possibly want including great live music and dancing in the streets! The Picture above is from the San Luis Obispo farmers market. If you have never been to this market you have no idea what you are missing. The San Luis Farmers extravaganza is far more than just fruit and vegetables. Believe, me it is a party. All the pictures on this page will be from the San Luis Market but we will supply information about all the farmers markets on the Central Coast of California. Believe me, these unique affairs are something special and to those of us who live on the Central Coast of California we love our fresh fruit and veggies. You can even find organic foods grown by certified organic grows on the central coast. This is a must do when you are visiting our towns and cities. If you miss this you miss seeing the true spirit of where we live. It is interesting to see what type people show up in each town. In San Luis Obispo, a college town, a lot of younger people come to the market. The younger crowd seems to add a little spice to the event. One other thing to mention, probably the most import thing of all about our markets is the FOOD. Man, let me tell you! 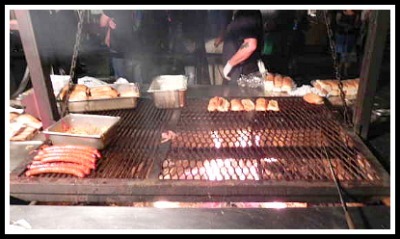 You can find the best barbeque's on the coast at these events. So, make sure you come hungry and bring a bag to carry home all the fruit and veggies you buy. Great Food at Every Market! Do you see the link sausage in the picture above? It will make you slap your grandma. I promise, the fresh cooked meat and produce is wonderfully delicious. When we go to the a farmers market anywhere on the central coast we always make sure we go hungry. In Cambria, California, our home town, we always eat barbecue beef cooked by Linn's Restaurant. It is the best in the world. I mean, even Texans can't cook this good. Well, maybe Texas barbecue is a close second. The truth is, it does not matter which farmers market you decide to go to, the cooking will be great. Do you like fresh flowers? Most of the markets have fresh cut flowers to enjoy. My wife loves the Sunflowers. The great thing about buying flowers from the Farmers Market is the price. Normally you can get a bundle of fresh flowers at a tremendous saving. So, if you like flowers try going to one of the many farmers fairs on the central coast. 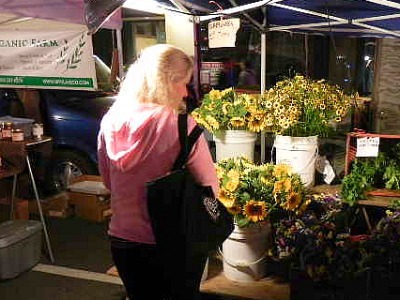 For a complete list of Farmers Market on the Central Coast Click on the link. Info - Farmers Markets on the Central Coast. 1. Cambria 's Market Click Here. We are going to provide you with more information about the coast than you can even imagine. We will be constantly updating our site so please sign up for the news letter. We will provide valuable coupons and directed you to great restaurants and places to shop. So, click on the orange RSS button and sign up for the newsletter, which is coming soon, to stay in touch. What is your favorite place to visit on the central coast? If you have visited the Central Coast you already know the splendor this unique area provides. 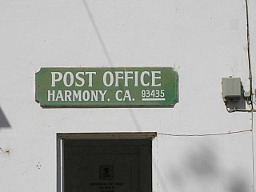 If you have been to this part of California, Central Coast Travel wants to hear your story and see your pictures. We want to share your story and pictures with the the world. Please take the time to tell us what you loved about your visit and don't forget the pictures. Please read our privacy statement if you are worried about your information being sold. Have A Great Story or Pics from the Central Coast? Do you have a great story or Pictures from the Central Coast? Share it!